Foie gras production may easily be responsible for some of the most inhumane treatment of farm animals in the world, but New Yorkers are taking a stand to get it out of their city. Foie gras, which is French for "fatty liver," involves force-feeding restrained ducks, or geese, by shoving metal pipes down their throats multiple times a day, called gavage, and pumping them full of grain, or corn and fat, which leads to acute hepatic lipidosis, or fatty liver disease. This in turn leaves ducks suffering with malfunctioning livers that are ten times their normal size, among other health problems that leave many unable to even breathe normally, or just stand and move around. Fortunately, the practice is considered so inhumane that it's already been banned in a dozen countries, while several others have a ban on force-feeding. Now, New York City may be next to act. Following a major win in California with the U.S. Supreme Court upholding the state's ban, Councilwoman Carlina Rivera has just introduced a bill that would ban the sale of foie gras in New York City over concerns about the cruelty involved in its production. If it's passed, anyone found breaking the law will be facing fines of up to $1,000, up to a year in jail, or both. So far, the bill has eight sponsors, but it's still going to need a lot of public support. 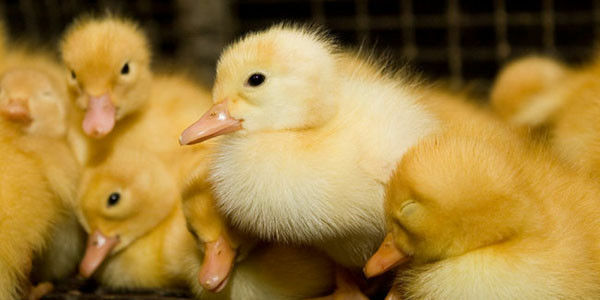 You can help by signing this petition urging the New York City Council to take a stand against cruelty by banning foie gras.